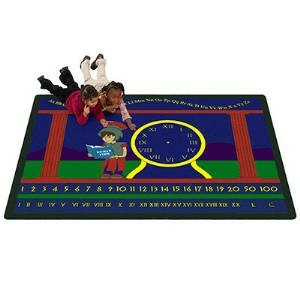 Roman Time® is the first rug to help teach kids Roman numerals. It has the complete alphabet in upper and lower case. Teaching how to tell time is easy with the large clock in the middle (clock arms included). The rug can teach Roman numerals 1-20, 30, 50, 100. Comes with a useful life warranty.